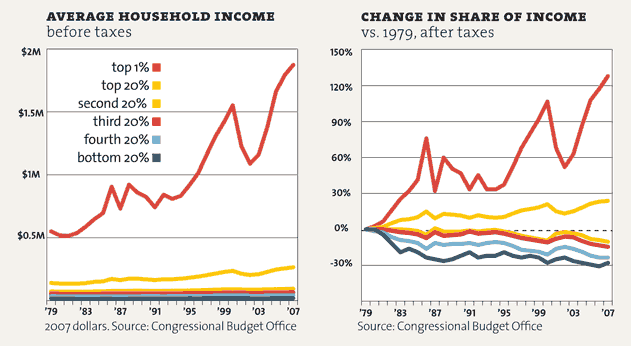 And you might assume that conservatives don’t worry about rampant inequality … but that is a myth. A who’s-who’s of prominent economists in government and academia have all said that runaway inequality can cause financial crises. Extreme inequality helped cause the Great Depression, the current financial crisis ... and the fall of the Roman Empire. But inequality in America today is actually twice as bad as in ancient Rome , worse than it was in in Tsarist Russia, Gilded Age America, modern Egypt, Tunisia or Yemen, many banana republics in Latin America, and worse than experienced by slaves in 1774 colonial America. Because they're saying one thing but doing something very different. And both mainstream Democrats and mainstream Republicans are using smoke and mirrors to hide what's really going on. A better explainer of growing inequality, according to Stiglitz, is the use of political power generated by wealth by certain groups to shape government policies financially beneficial to them. This process, known to economists as rent-seeking, brings income not from creation of wealth but from "grabbing a larger share of the wealth that would otherwise have been produced without their effort"
securing government tolerance of monopoly power (The richest person in the world in 2011, Carlos Slim, controlled Mexico's newly privatized telecommunication industry). One big part of the reason we have so much inequality is that the top 1 percent want it that way. The most obvious example involves tax policy .... Monopolies and near monopolies have always been a source of economic power—from John D. Rockefeller at the beginning of the last century to Bill Gates at the end. Lax enforcement of anti-trust laws, especially during Republican administrations, has been a godsend to the top 1 percent. Much of today’s inequality is due to manipulation of the financial system, enabled by changes in the rules that have been bought and paid for by the financial industry itself—one of its best investments ever. The government lent money to financial institutions at close to 0 percent interest and provided generous bailouts on favorable terms when all else failed. Regulators turned a blind eye to a lack of transparency and to conflicts of interest. No wonder the government has saved the big banks at taxpayer expense, chosen the banks over the little guy, and said no to helping Main Street ... while continuing to throw trillions at the giant banks. Without the government’s creation of the too big to fail banks (they’ve gotten much bigger under Obama), the Fed’s intervention in interest rates and the markets (most of the quantitative easing has occurred under Obama), and government-created moral hazard emboldening casino-style speculation (there’s now more moral hazard than ever before) … things wouldn’t have gotten nearly as bad. In today’s edition of Bloomberg Brief, the firm’s economist Richard Yamarone looks at one of the more unpleasant consequences of Federal monetary policy: the increasing schism in wealth distribution between the wealthiest percentile and everyone else. 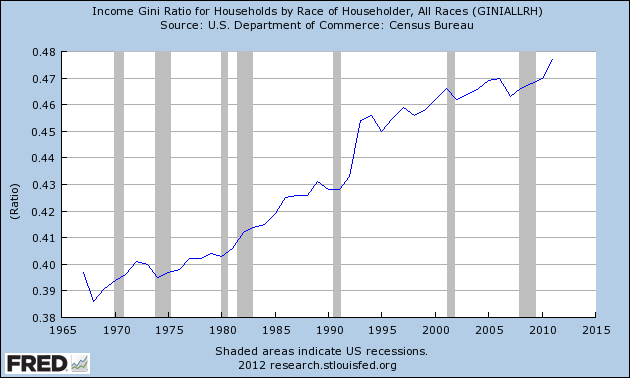 … “To the extent that Federal Reserve policy is driving equity prices higher, it is also likely widening the gap between the haves and the have-nots….The disparity between the net worth of those on the top rung of the income ladder and those on lower rungs has been growing. According to the latest data from the Federal Reserve’s Survey of Consumer Finances, the total wealth of the top 10 percent income bracket is larger in 2009 than it was in 1995. Those further down have on average barely made any gains. 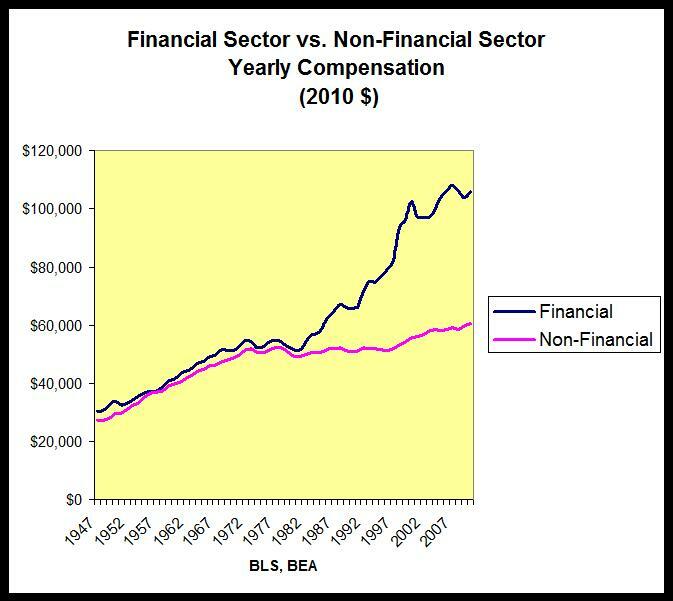 It is likely that data for 2010 and 2011 will reveal an even higher percentage going to the top earners, given recent increases in stocks.” Alas, this is nothing new, and merely confirms speculation that the Fed is arguably the most efficient wealth redistibution, or rather focusing, mechanism available to the status quo. This is best summarized in the chart below comparing net worth by income distribution for various percentiles among the population, based on the Fed’s own data. In short: the richest 20% have gotten richer in the past 14 years, entirely at the expense of everyone else. CNN Money pointed out in 2011, “Wal-Mart’s core shoppers are running out of money much faster than a year ago …” This trend has only gotten worse: The wealthy are doing great ... but common folks can no longer afford to shop even at Wal-Mart, Sears, JC Penney or other low-price stores. Government policy has created these conditions. And the pretend populist Obama - who talks non-stop about the importance of job-creation - actually doesn't mind such conditions at all. Large banks, who are doing much better and large corporations, whom you point out and everyone is pointing out, are in excellent shape. The rest of the economy, small business, small banks, and a very significant amount of the labour force, which is in tragic unemployment, long-term unemployment – that is pulling the economy apart. The study ... conclusively found that the wealthy benefitted from low tax rates on investment income, which in turn caused their wealth to grow faster. Ronald Reagan's budget director, assistant secretary of treasury, and domestic policy director all say that the Bush tax cuts were a huge mistake. See this and this.